Like this: at the top of UPI’s “Top News Photos” section today were pictures from inside and outside the general assembly… where it looks like everyone is dancing. Incidentally… is Kadhafi engaging in a little stealth disco? Turn your handwriting into a true type font, for free! Want a vanity font to go with your vanity plates and vanity domains? You can do it without having to learn post script or hiring a typography expert. 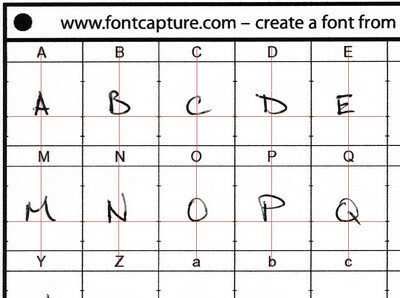 Just hop on over to http://www.fontcapture.com. The process is simple: print out their form, write out the alphabet, scan the form back in and upload to their server. Your font is available pretty much instantly. Best part: it’s free (we’ve already established I’m cheap). How long does it take you to write 127 letters? It honestly is easy, I made the first draft of my font in less than 10 minutes. If you want a quality font, however, you will want to tweak the letter size and alignment to make them consistent and aligned. For me that was another 30 minute investment. To be clear, you should not scan letters from your friends and create a font to impersonate them. That would be wrong Steve. 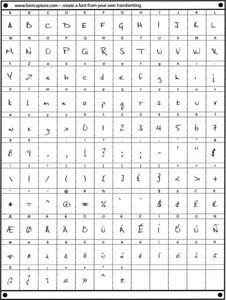 Author Reeves LittlePosted on September 1, 2009 July 18, 2014 Categories SitesTags Useful SiteLeave a comment on Turn your handwriting into a true type font, for free!